Buyer’s remorse ensued quickly (at least once the novelty of having an iPad wore off). I soon learned that their were far more elegant options to protecting one’s iPad, such as the Colcasac sleeve (http://www.colcasac.com/ipad-sleeve) or the Dodo case (http://www.dodocase.com/). I dithered for months but finally settled on the ZAGGmate with keyboard. 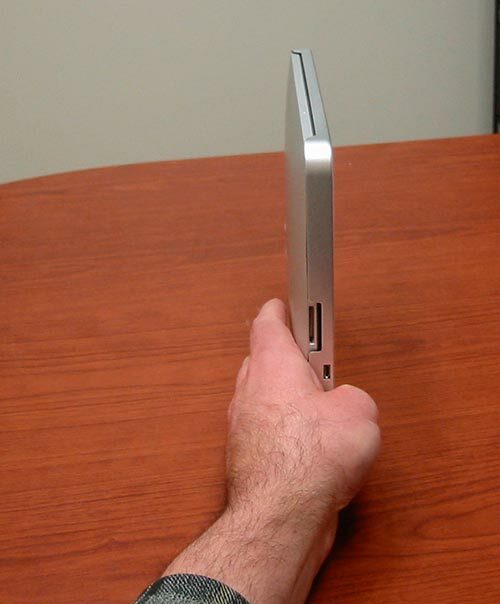 Figure 1: The iPad plus ZAGGmate is only marginally thicker than the iPad alone. compact but still do a good job of protection. The ZAGGmate fits both these qualifications. In position, the case and iPad combination take up only a little more space than the iPad alone (Photo 1). And the ZAGGmate’s aircraft-grade aluminum (matching the look of the iPad) and high-density padding protect the tablet. 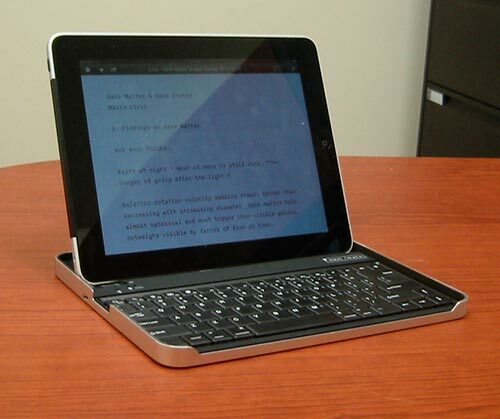 Figure 2: he ZAGGmate has a hinged device that raises up and locks in place to support the iPad. The ZAGGmate and iPad separate easily. 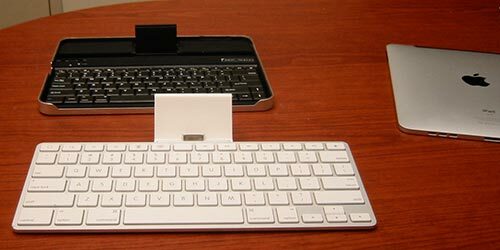 The keyboard uses a Bluetooth interface, so you have the option of either setting the iPad to one side and typing away, or else raising a hinged device on the keyboard (Photo 2) and placing the iPad into a crease in the keyboard and leaning it against the hinge (Photos 3, 4). So far, I’ve always used it in the latter configuration. Figure 3: The iPad in position (profile view). Figure 4: The iPad in position (front view). ZAGG also offers a ZAGGmate case without keyboard, but I went with the keyboard because the Apple keyboard dock is ungainly and awkward to pack, with its fixed protuberance for the iPad to lean against (Photo 5). 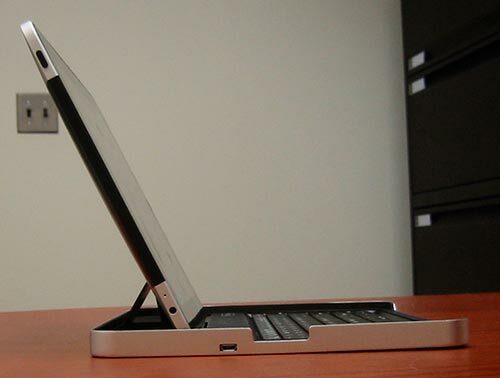 Figure 5: The Apple keyboard dock has a fixed, ungainly protuberance that makes it hard to pack. The primary disadvantage is that the keyboard is small compared with the Apple keyboard (Photo 6) though this may be more of an issue for me because I have large hands (Photo 7). I have also been annoyed at how quickly the keyboard’s battery runs down when I forget and leave the Bluetooth interface on, which is frequently. It would also be nice if there were some way of stowing the ZAGGmate on the back of the iPad for when you don’t need the keyboard but don’t want to just leave it lying around. 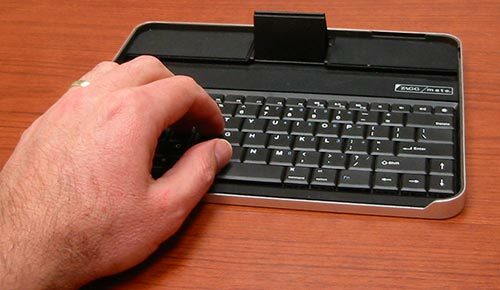 Figure 6: The primary disadvantage: the keyboard is smaller than the standard size. Figure 7: Which is awkward for my large fingers. I made extensive use of the iPad with the ZAGGmate on a recent visit to my parents. I had to spend several hours keeping up with my day job while there, for which I needed Internet access. With dial-up as the only alternative available in the house, I used the iPad’s cellular connection. 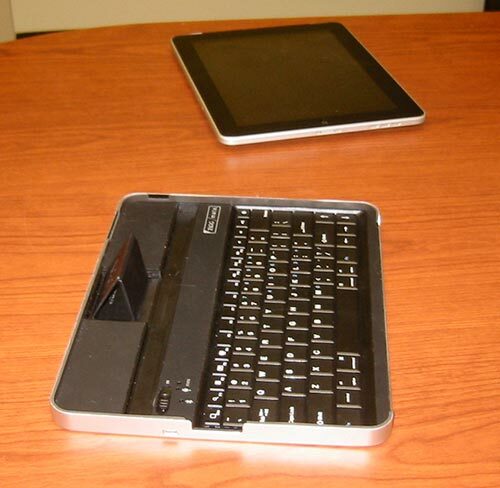 The tablet sat in the keyboard on one side of the desk, while my office laptop sat on the other side. For off-line activities, I used the laptop. When I needed to check or send emails or do some on-line research, I just turned to the iPad. This was a very effective approach. The keyboard size was only a minor annoyance, and I prevented the battery rundown problem by just leaving the keyboard plugged in the entire time. So I am very happy with the ZAGGmate with keyboard and would recommend it to anyone looking for a compact, elegant, rugged solution to traveling with an iPad and keyboard. The ZAGGmate is available for $99 directly from ZAGG (http://www.zagg.com/accessories/zaggmate-ipad-case), from numerous mail-order retailers, or in-store from Best Buy.